Anyone who doubted an installation show to be ceremonious enough for the opening of FDCI’s India Couture Week 2017 should have walked into Anamika Khanna’s surreal wedding mandap at The Kila. Trust this designer from Kolkata to conjure spectacles with a twist each and every time. Perhaps that is why she’s one of the most venerated and her creations so coveted. 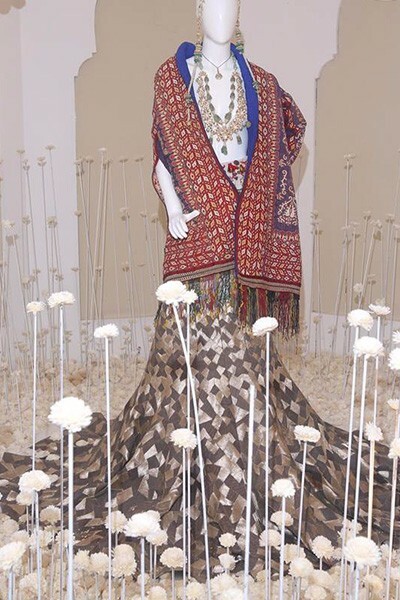 Taking a cue from the popular global trend where fashion greats are taking the installation route, Khanna conceptualised a show that offered an up, close and personal interaction with her craft. In association with exquisite bijouterie (in tandem with the style of Khanna, traditional design styled in a modish wrap) from Jaipur-based Birdhichand Ghanshyamdas Jewellers, Khanna’s presentation, bordering on India’s tribal art forms, left an indelible impression. A deviation from the usual jewel tones, reds and maroons, ubiquitous in our weddings, Khanna kept her bases pretty monochromatic, focusing on jades, washed blues, nudes, pastels for the pre-wedding functions, perfect canvases for the intricate embroidery that embellished almost all the apparels. For the wedding though there were the pinks, ivory, purples, hot pinks and greens— handwoven fabrics were the mainstay here and given a stylish spin with embroidery that is rich and indigenous. 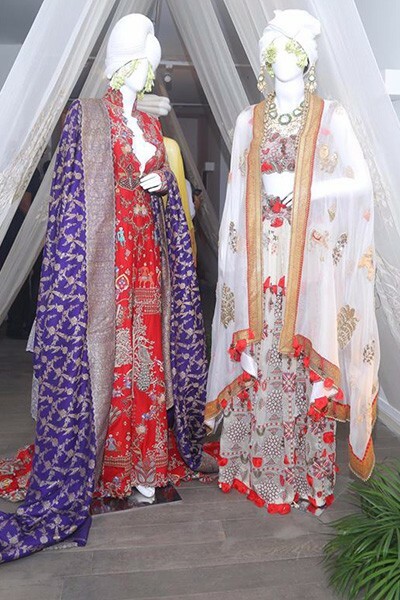 Through zardozi, old kinaris, dori work, Parsi gara, burnished gold and silver work, bead work, gota patti, plumes, the couturier offered a window into something that is painstaking and laborious and hence, something that connoisseurs need to celebrate. 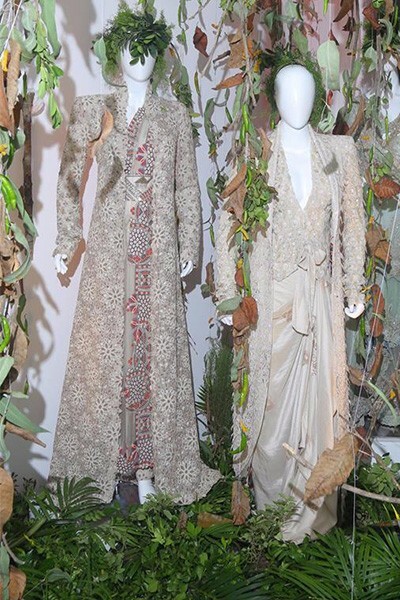 Rohit Bal stood silently in one corner of the large hall at Bikaner House, beaming shyly as models strutted down the ramp in creations from Shahaan-e-Khaas, the unflappable couturier’s ode to the costumes of the Mughals that one sees immortalised in museums. Bal was doing what he does best—showcasing a collection that is glamorous, elaborate and bears the leitmotif of his irrepressible ingenuity. The first few outfits were a celebration of ivory, Bal’s signature hue almost. Intricate and exquisite Kashmiri embroidery suffused elegant grandeur into the creations. 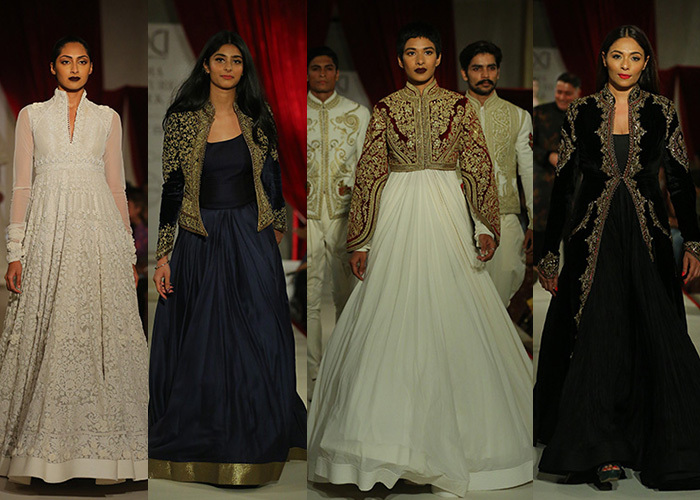 Bal played with volume but kept it restrained with well-cut jackets, capes, bandh gala tops and anarkalis. 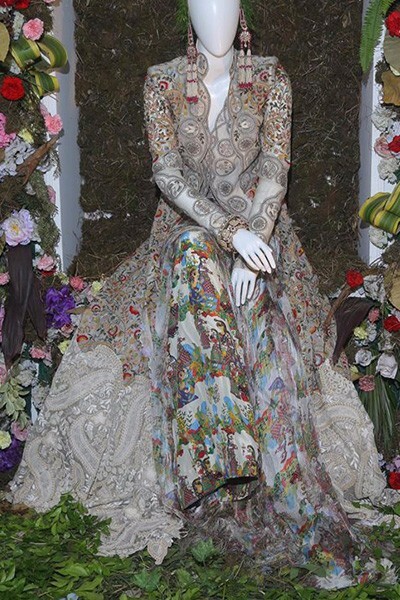 Kashmir has been playing a significant role in Bal’s designs, and this year the much-loved lotus and peacock motifs find friends in the rooster and a plethora of others (that he has even patented). 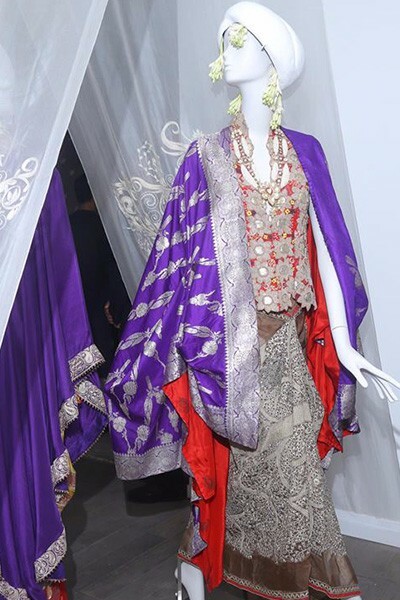 Royal indigo, pale rose and black were the other hues highlighted in silks, velvet and wool embellished with stunning Kashmiri embroidery, lending a golden sheen to the outfits. 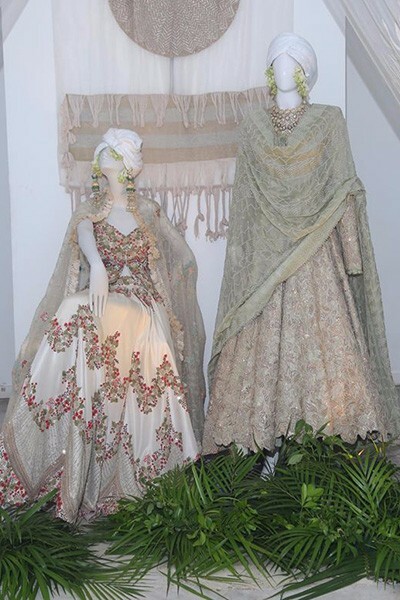 A paean to lost crafts and traditions with a gentle nudge of contemporary influences, Bal’s collection sets the mood for an opulent and lush wedding season.